There can be little disagreement that the proliferation of wireless technology has greatly influenced the ways that people communicate today, how quickly they can contact each other, and the vast distances over which they can connect, virtually by pushing a button or two. And as these high-tech devices continue to be developed and/or refined, there is considerable emphasis on the part of their manufacturers to expand their scope of use throughout the general population. So how might such advancements in communication technology apply to individuals with hearing impairment? 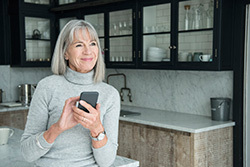 With the introduction of smartphone-compatible hearing aids, it means that those with hearing loss can now enjoy all the conveniences and benefits of the latest in mobile phone technology; and these revolutionary hearing aids can connect directly to a smartphone without a separate remote-accessory transmitter (or streamer). These made-for-iPhone hearing aids are compatible with the more recent series of Apple phones (from iPhone5 and up); furthermore, they are also engineered to work with other Apple products such as the iPad, iPod touch, and Apple Watch. Connectivity is possible with smartphones on other mobile operating systems as well, e.g. : Android, through the use of an additional transmitter/streamer, provided that the phone has a wireless option. These smartphone-compatible hearing aids have truly expanded the realm of possibilities for people with hearing loss whose desire to use smartphone technology had previously been restricted. ReSound LiNX2, ReSound ENZO2, and Starkey Halo 2 hearing aids are available upon consultation with a hearing aid specialist from Bravo Hearing Centre in Etobicoke. 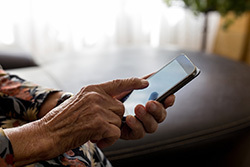 While the specific choice of smartphone-compatible hearing aids will likely be influenced by an individual’s lifestyle needs and personal preferences, the severity of their hearing loss can also play a role. Therefore, people with hearing loss who might have an interest in this technology should contact Bravo Hearing Centre to Book a Hearing Test in order to determine whether their hearing level has recently changed, and in turn help them make a more informed decision on the hearing aid option/model that best suits their situation. An up-to-date assessment of hearing level, in conjunction with the professional insight and guidance of a hearing loss specialist from Bravo Hearing Centre, can aid in selecting the smartphone-compatible hearing aid that best suits an individual’s hearing needs and lifestyle. If you have any questions pertaining to the choice or the use of smartphone-compatible hearing aids, call the hearing aid specialists at Bravo Hearing Centre today at 647-694-4626 to request a complimentary consultation at your convenience. There can be little disagreement that the proliferation of wireless technology has greatly influenced the ways that people communicate today, how quickly they can contact each other, and the vast distances over which they can connect, virtually by pushing a button or two.